Nearly all sextants were made right handed, that is to say, the instrument was held in the right hand and the adjustments to the index arm made with the left hand which, for ninety percent of us, is the non-dominant hand. Furthermore, for some strange reason, the legs were usually placed on the same face of the instrument as the handle, so that to set it down safely on its legs, the frame had first to be grasped in the left hand. 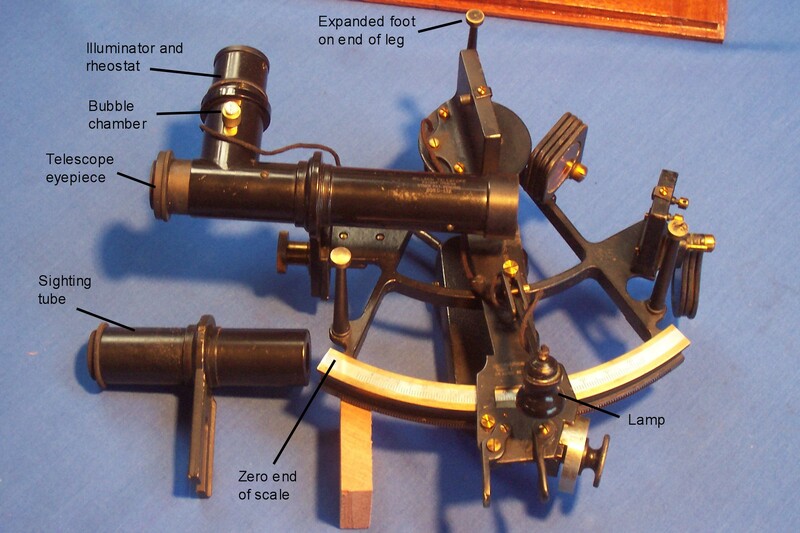 As far as I know, only Brandis and Sons, Inc. made a left handed sextant, and only that firm and the French firm of Le Petit-Poulin fitted the legs on the opposite face to the handle. The Brandis Aeronautical Octant Mark I, Models 3 and 4, were sextants (strictly speaking, octants) that were left handed and had the legs on opposite sides to the handle, so that the instrument could safely be set down without juggling it from one hand to the other. Moreover, the ivorine note pad on the handle was accessible to right-handers. Hughes and Son sometimes also provided note pads on the handles of their higher-class sextants , but they were of course only of use to left-handers. A Brandis Aeronautical octant recently came into my hands. It is the 125th example of Brandis’s Model 206C. The Smithsonian Museum has two, one of which has the higher serial number of 134, but it is unlikely that more than two hundred were made. It also has a Bureau of Aeronautics number of 33-31, dating it to 1931. It is essentially a small left-handed nautical micrometer octant of 130 mm radius fitted with a Willson bubble telescope and also provided with a plain sighting tube and eye shades. The expanded ends of the legs slide into fittings in the floor of the case and a wooden piece is slid across to prevent the top leg from sliding out. Another interesting feature of the case is that it has a loose sliding lid which was held closed by two hooks and eyes and a lock. No doubt this was an annoyance to the aviator, who would have to find somewhere to put the lid while extracting the instrument. Although C Plath had started to make micrometer sextants in about 1906, it took other manufacturers until the mid 1920s to follow suit. The micrometer screw is short, having only five threads and is of relatively large diameter, while the rack is rather narrow. The micrometer drum reads to single minutes and has no vernier. The release catch operates a cam that presses on the swing arm chassis to disengage the micrometer screw from the rack. 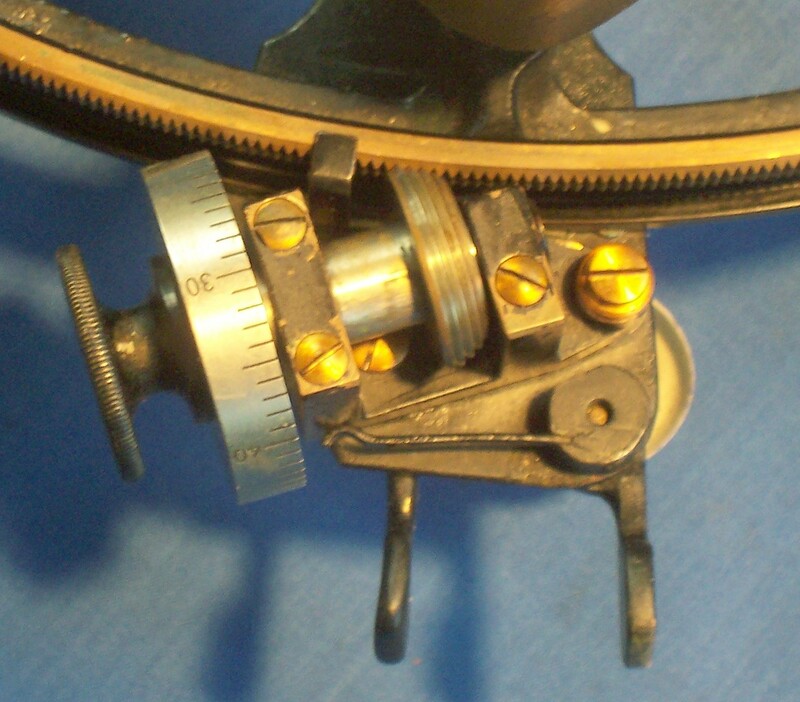 The index arm keeper is a slender piece of bent brass that would certainly suffer if the sextant were to have been picked up by the index arm. Of interest perhaps only to air navigation enthusiasts is the Willson bubble telescope. It is a two-power inverting telescope of 18 mm clear aperture, with a Ramsden eyepiece. Between the field and eye lenses, a partially reflecting mirror provides a view of the bubble in the chamber lying above it. The chamber can be adjusted up or down to focus on the bubble and it is illuminated from above by a frosted lamp shining through an iris diaphragm and diffuser. A rheostat and on-off switch is built into the lamp housing. It is far from easy to remove the lighting assembly, so I am forced to the conclusion that no provision was made for illuminating the bubble by daylight. 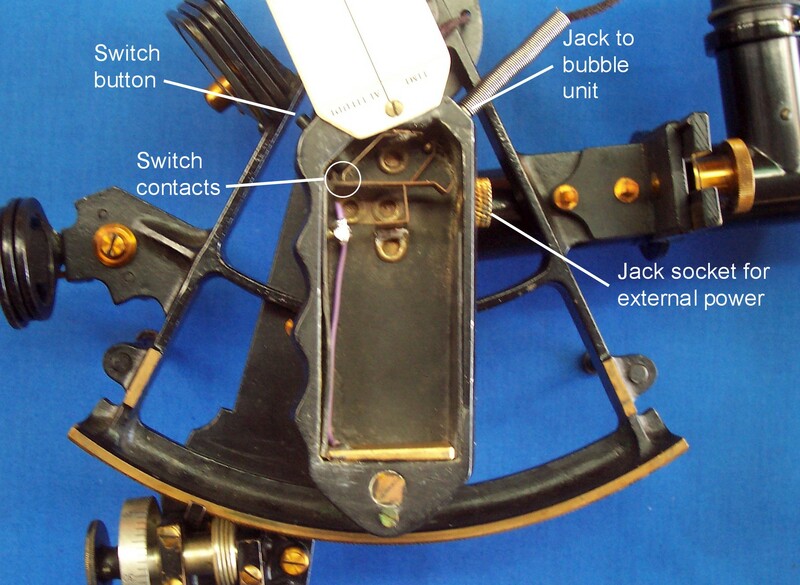 When used as a bubble sextant, the telescope would be used close to the frame, to intercept nearly all the light from the index mirror, but there is sufficient travel of the rising piece for the telescope also to function well in the normal, nautical mode. If you would like more details of this instrument do contact me. You will find much more about the nautical sextant in general in my book “The Nautical Sextant“. 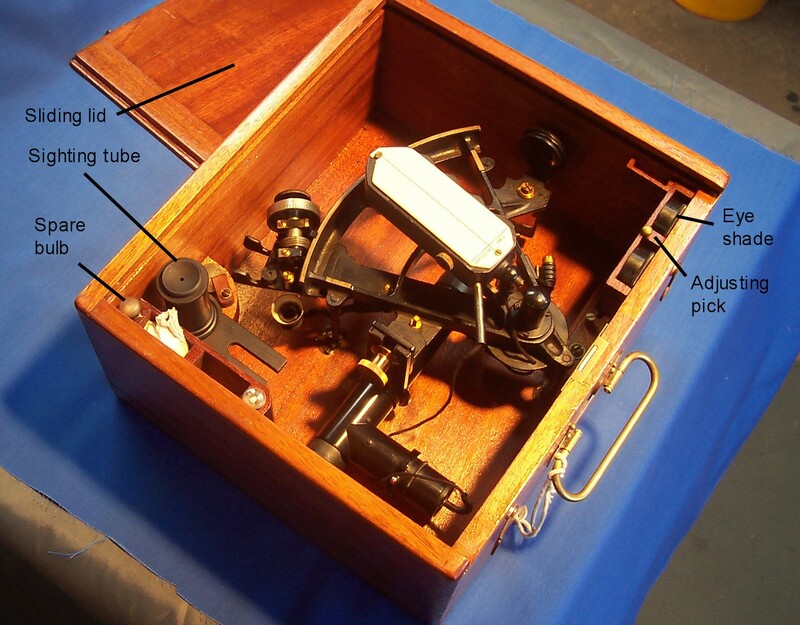 Update 6 February 2017: At least one early Coutinho-pattern aeronautical sextant was made left handed. It is in the Museu Marinha in Lisbon.